The EWWW I.O. plugin for WordPress has a feature called Background Optimization, that allows uploaded images to be inserted into a queue instead of being processed during upload. This makes for faster uploads, and a better user experience. However, some bulk image importing plugins can clog up the queue, resulting in a backlog of images, many of which will never be optimized. If images seem to be stuck saying "In Progress for more than 5-10 minutes, it is likely that your queue has gotten too large. To check the queues, you first need to turn on EWWW's debug option in the settings. Then there will be a couple new items under the Media menu. 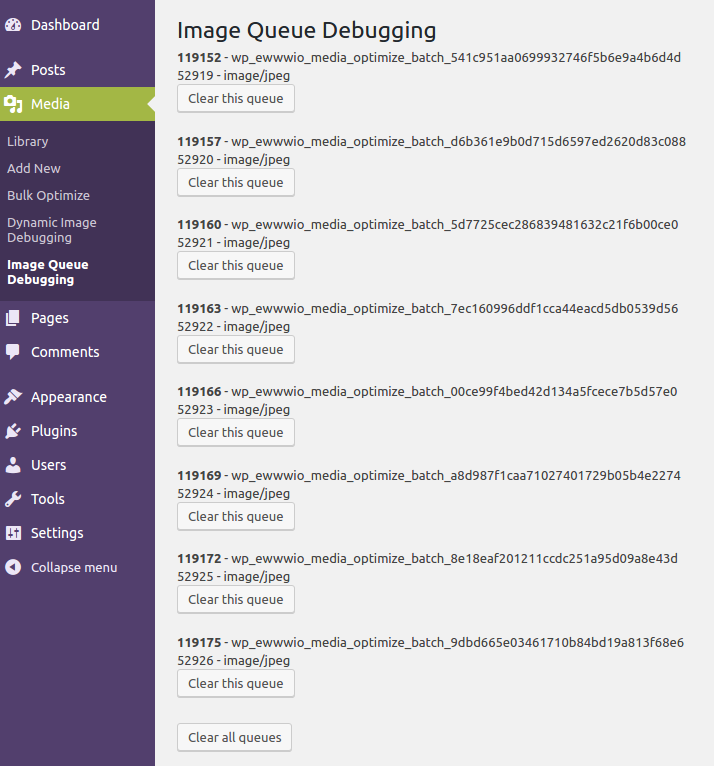 Go to the Image Queue Debugging page, and it will show you all the images that are queued currently. If the page actually loads, and there do not seem to be too many images there, you can just keep an eye on things while the images get processed. If you don't want to wait, you can clear the queue(s) and bulk optimize the remaining images. Often though, if there are too many images in the queue, the Image Queue Debugging page will not even load, but will timeout instead. In this case, a little more manual approach is needed. You will need to open up your WordPress database using a tool like phpmyadmin (unless you are a DBA with mad skills), and navigate to the wp_options table. Then tell MySQL to delete all items from the table where option_name matches 'ewwwio_media_optimize_batch'. You will usually need to use wildcards on either end, like this '%ewwwio_media_optimize_batch%'. The easiest way to do this is to use the Search feature in phpmyadmin, and then delete the items that are found in batches.